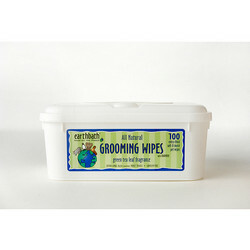 Product description:Heavenly scented with the natural extract of Green Tea Leaf, earthbath Green Tea Leaf Grooming Wipes safely and easily wipe away dirt and odor. Mild cleansers freshen and deodorize as the anti-oxidant properties of Green Tea Leaf Extract protect from environmental damage. Your best friend will look and smell better than ever before!